This returns the details required to show an asset class to a user. This method will be called at least once for each asset that appears in a user's inventory. It is heavily cached so it may be called less often than once per asset view. If you need to invalidate the cache for any reason you can change the Asset Class Version under the Economy tab of the technical details for your app. Usually the class identifiers are entirely defined by the game in which the asset exists. The one exception is currency. The Steam Economy server may call GetAssetClassInfo with a single identifier called "currencyid" with a value equal to the ID of the currency it needs to look up. In this case the asset server should return currency display details instead of asset display details. class_count uint32 ✔ The number of class identifiers specified. asset - An object containing display details for the specified asset class identifiers. background_color - An RGB hex color value represented as a string. icon_url - The icon to use for this asset. This image should be in the JPEG, GIF, or PNG formats. PNG or GIF are preferred because they support transparency. Games can provide one size of icon via this field and Steam will scale it to fit the UI as appropriate. This icon should be at least 200x200 pixels in size. Steam will provide CDN distribution for all images when they are displayed to users so the number of hits to this URL will be relatively low. icon_url_large (optional) - The large icon associated with the descriptions. Image format rules are the same as icon_url. This large icon should be at least 330x192 pixels in size. If icon_url_large is not provided, icon_url will be used instead. Steam will provide CDN distribution for all images when they are displayed to users so the number of hits to this URL will be relatively low. they appear in the array in tooltips and detailed item descriptions. type (optional) - The type field controls how the value field is rendered. text - The value will be interpreted as raw translated text in the specified language. Some characters (less than, greater than, etc.) will be converted to HTML entities so they won't be interpreted as tags. Every linefeed character will be converted to <br>. This type should be used for user-provided data. text is the default type if no type is specified. html - The value will be include in the page as HTML with tags left intact. image - Value is the URL of an image to show for this description. Steam will put a CDN in front of the image so the number of hits to this URL will be relatively low. value - Translated string to display for this description. color (optional) - An RGB hex color to use for the value. Use whatever color this information appears in on in-game UI. This field only applies to values of type text. label (optional) - If this field is present the description value will be prefixed with this label. tags (optional) - An array of tags that apply to the asset. These are displayed as filtering options to the user in various places of the UI, including the Community Market and in users' Inventory. internal_name - A name to identify this tag. The internal name is not shown to the user. Do not use spaces, non-ASCII, or non-printable characters in the internal_name. name - The localized name of this tag. Displayed to the user. category - The category to place this tag in. This is only used internally for grouping and not shown to the user. Do not use spaces, non-ASCII, or non-printable characters in the category. category_name - The localized name of the category. Displayed to the user. color (optional) - An RGB hex color to use when displaying the tag's name. marketable (optional) - If this is true the item will be allowed to be sold on the Steam Community Market. (Default: False). NOTE: Community Market listings cannot currently be tested. Listing an item on the Community Market will immediately expose it, even if the game's economy is marked as private. market_name (required if marketable) - If the item is marketable, this is the name which will be used to group items together and will display on the Community Market. This should be localized where possible. market_hash_name (required if marketable) - This should always be the English value of market_name. This is used to correlate the various versions together and show price history and other information. NOTE: This value is not authoritative. Steam does not enforce this restriction for you. The value of this field is only used to inform users that a restriction exists. After an item is purchased, it is the asset server's job to place the trade restriction on the new item. The asset server can do this when TradeSetOwned/v0001 is called when is_market is set to 1 and audit_action is set to 101. NOTE: This value is not authoritative. Steam does not enforce this restriction for you. The value of this field is only used to inform users that a restriction exists. After an item is purchased, it is the asset server's job to place the market restriction on the new item. The asset server can do this when TradeSetOwned/v0001 is called when is_market is set to 1 and audit_action is set to 101.
actions - An array of actions (links), usually to show more information about an asset. These are displayed as buttons below the description on the inventory page. These links will be opened in the user's default browser. link - The URL to navigate to when the button is clicked. The tokens %assetid%, %contextid%, and %appid%, will be replaced with the asset's ID, context ID, and owning app ID, respectively. name - The label to display on the button. owner_descriptions - An array of descriptions that are only shown to the owner of the asset. The contents of this array are exactly like those in descriptions. The only difference between the two lists is who can see the descriptions. owner_actions - An array of actions that are shown only to the owner of the asset. The format should be the same as actions. These represent special actions only available to the person who owns the asset, such as activating or modifying the asset. fraudwarnings - An array of strings of fraud warnings to display if the item is added to a trade. These are displayed in red if the item is added to a trade. name_color - An RGB hex color to use for the name. 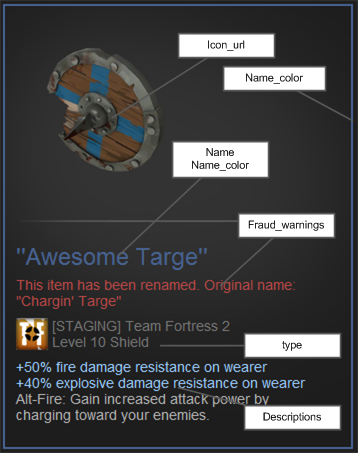 This should match any rarity or quality-based color coding of asset names in your game. contained_item (optional) - This node should contain a complete asset block for an item contained inside this asset. Source games use this for wrapped gifts, but it may not apply to your game. cache_expiration (optional) - RFC 3339 UTC formatted time that Steam's cache of the response should be invalidated. Use only if any portion of the GetAssetClassInfo response will change at a later time even though the set of asset class properties did not change. This will be useful, for example, if the item becomes tradable at a later time. We recommend rounding up times in asset class properties (and thus also in this field) up to day or hour boundaries to improve Steam's ability to cache asset descriptions. item_expiration (optional) - RFC 3339 UTC formatted time of when the item can no longer be used. Any Market listings will not be purchasable after this time and will be automatically canceled.